Make inroads in Scandinavia and stop wasting time tracking down B2B sales leads when you download this affordable Denmark email database, which includes all of the accurate information you will need to network with Danish contacts and grow your business. The business pace in Denmark is brisk, which means that you need a reliable business contact list to keep up with the competition. If you want to get your business noticed by important Danish deal-makers, get this affordable Denmark email list. Cut to the chase and find strong sales leads all over the country with one simple download! Our Denmark mailing list is a comprehensive B2B resource that features real, accurate information you can use to directly market to highly qualified Danes with the power to purchase your products for their companies. 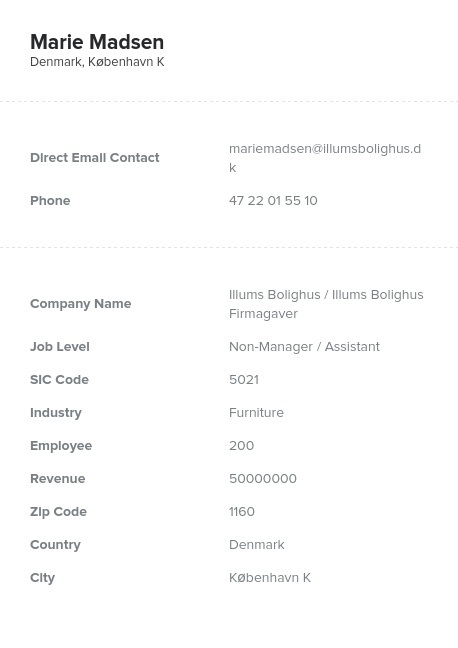 You won't waste time trying to get through to businesses using generic email addresses or phone numbers that just lead to receptionists, not real decision-makers, once you arm your sales team with this accurate Denmark email database. At Bookyourdata.com, we pride ourselves on having the highest-quality contact lists at reasonable prices, so when you buy this mailing list of Danish business contacts, you know that there won't be anything rotten in it! We check and recheck all of our data regularly with both machines and real people to ensure that it's not outdated or incorrect, and we even have a deliverability guarantee. Trust the experts in email marketing lists to deliver the sales leads you need to succeed in Denmark. Trust Bookyourdata.com and you'll be glad you did.